Recently I was chosen to participate in the #GarnierStyle Voxbox Campaign, courtesy of Garnier Fructis and Influenster. As you know, I have natural hair. This made me a bit weary about trying out the products. I typically try to use as few products as possible in my hair as my natural hair is so quick to experience residue build up. However, the products were free, so I had nothing to lose. Influenster sent me two products, both shown below. I received these complimentary products in exchange for my honest opinion. I was excited to get to try these products out because Garnier Fructis was my go to brand when I had relaxed hair. I had nothing but positive experiences with the brand. I hadn’t use the line on my natural hair until just recently. My relaxed hair loved these products! If you’re curious to see how the products did on my natural hair, go watch my live demo video here on Youtube! 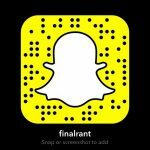 Want even more #FINALRANT ?! Join the mailing list today!